Greetings. This is the New York Rare Bird Alert for Friday, December 30th, at 9:00pm. The highlights of today's tape are MOUNTAIN BLUEBIRD, RUFOUS HUMMINGBIRD, BROWN PELICAN, EARED GREBE, SNOWY OWL, NORTHERN SHRIKE, BARROW'S GOLDENEYE, KING EIDER, EURASIAN WIGEON, and more. Before doing the Christmas Count summaries, a female-type MOUNTAIN BLUEBIRD was first spotted Monday and was still present today, southeast of Wading River and just north of the Calverton Grasslands in Suffolk County. To reach this site from Route 25, west of Riverhead, take Route 25A west a short distance to Hulse Landing Road, on the right. A parking turnout is available, just as you turn onto Hulse Landing Road. The bluebird often uses the snow fence in the field east of and parallel to 25A before you reach Hulse Landing Road. It has also been seen using fencing at the Haunted House, a few hundred yards down 25A, after Hulse Landing Road. It also disappears at times, today flying due north from the field, landing on distant utility wires before dropping down into back fields but it does seem to return regularly to the snow fence along 25A. The Bronx-Westchester Christmas Count Monday recorded 115 species, highlights including a GREATER WHITE-FRONTED GOOSE on the Van Cortlandt golf course, a EURASIAN WIGEON on Premium Mill Pond in Larchmont, a female BARROW'S GOLDENEYE off City Island, 55 NORTHERN GANNETS, 8 GREAT EGRETS, 7 BLACK VULTURES, 8 BALD EAGLES and 9 RED-SHOULDERED HAWKS, CLAPPER RAIL, VIRGINIA RAIL, 7 RAZORBILLS, 4 COMMON RAVENS, 2 MARSH WRENS, 2 HOUSE WRENS, ORANGE-CROWNED WARBLER, PALM WARBLER, CHIPPING SPARROW, and SALTMARSH SPARROW. The Central Suffolk Count on Tuesday featured a few AMERICAN BITTERNS and RED-NECKED GREBES, BLACK VULTURE, over 125 BLACK-LEGGED KITTIWAKES and 80 RAZORBILLS, a SNOWY OWL at Moriches Inlet, EASTERN PHOEBE, the previously mentioned MOUNTAIN BLUEBIRD, ORANGE-CROWNED WARBLER, and 3 PINE SISKINS. The SNOWY OWL was noted again around Moriches Inlet, west of Cupsogue County Park, on Thursday. The Smithtown Count on Tuesday noted 107 species, including a GREATER WHITE-FRONTED GOOSE on the Stony Brook Mill Pond, RED-NECKED GREBE, 36 NORTHERN GANNETS, AMERICAN BITTERN, GREEN HERON, BALD EAGLE, 3 VIRGINIA RAILS, 14 RAZORBILLS, HOUSE WREN, 3 MARSH WRENS, NASHVILLE WARBLER, PINE WARBLER, PALM WARBLER, and CHIPPING SPARROW. A female-type RUFOUS HUMMINGBIRD, lingering in Manhattan, was still present today around plantings just east or left of the entrance to the planetarium off 81st Street at the American Museum of Natural History. -- A DICKCISSEL continues in Inwood Hill Park with House Sparrows, seen recently in fields off Dyckman Street. -- Bryant Park, below 42nd Street at the New York Public Library, continues to produce two YELLOW-BREASTED CHATS and a LINCOLN'S SPARROW, with other recent highlights including two OVENBIRDS and two COMMON YELLOWTHROATS. -- An immature RED-HEADED WOODPECKER remains in the northwestern part of the Hallett Sanctuary in the southeastern corner of Central Park, and other notables recently in the park featured a BARRED OWL, EASTERN PHOEBE, ORANGE-CROWNED WARBLER, and BALTIMORE ORIOLE. 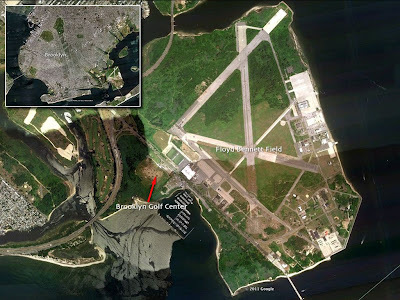 -- Swindler's Cove Park in upper Manhattan produced AMERICAN WOODCOCK and ORANGE-CROWNED WARBLER on Monday. The ORANGE-CROWNED was still present today. The EARED GREBE continues at Jamaica Bay Wildlife Refuge in the bay, south of the West Pond trail, usually in the eastern section of the bay closer to Cross Bay Boulevard. A drake EURASIAN WIGEON was also spotted from the West Pond Tuesday. The Floyd Bennett Field NORTHERN SHRIKE was seen at least to Tuesday but not reported since. Look for it along the northern runways. On Monday afternoon an immature BROWN PELICAN was spotted on a bar inside Jones Inlet as viewed from Point Lookout, and three HARLEQUIN DUCKS were along the inlet jetty. A female KING EIDER was still off Glen Cove on Tuesday. At Shinnecock today, a few BLACK-LEGGED KITTIWAKES and RAZORBILLS were present off the inlet, and an ICELAND GULL visited Tiana Beach off Dune Road. The influx of RAZORBILLS into western Long Island Sound continues, with small numbers to be encountered off both Nassau and Westchester shores. This juvenile Red-tailed Hawk was perched in a large conifer at the New York Botanical Garden. Unfazed by the throngs of families passing by on their way to the annual train show, this young raptor was no doubt scanning for one of the garden's many well fed squirrels. 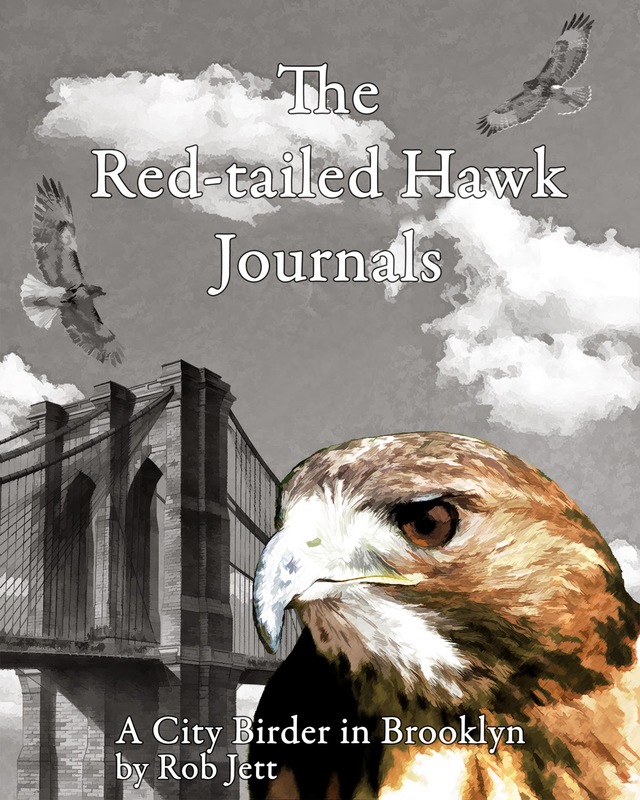 Red-tails nest in all of the city's five boroughs. Sunday, January 1, 2012, 10 a.m.
Saturday, January 1, 2012 from noon till 2:00pm. Protectors of Pine Oak Woods along with Natural Resources Protective Association are hosting the 22nd annual nature walk along Crooke's Point to greet the new year with friends and colleagues. Share your snack food of choice as we discuss current environmental issues and plan for the year to come. Meet in the main parking lot at the corner of Hylan Blvd. and Buffalo Street. Greetings. 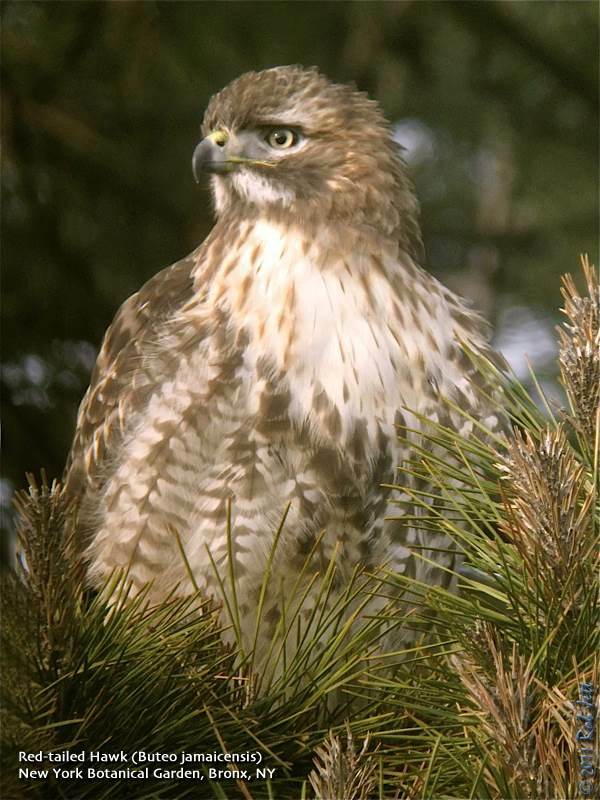 This is the New York Rare Bird Alert for Friday, December 23rd 2011 at 9pm. The highlights of today's tape are RUFOUS HUMMINGBIRD, BLACK GUILLEMOT, DOVEKIE, RED PHALAROPE, EARED GREBE, BLACK RAIL, BLACK-HEADED GULL, SNOWY OWL, BARROW'S GOLDENEYE, KING EIDER, NORTHERN SHRIKE, CLAY-COLORED SPARROW and much more. The Christmas Count season has begun with some great finds locally but probably the best find occurred Thursday in Greene County when a GRAY-CROWNED ROSY-FINCH was photographed on Black Dome Mountain in Windham this a new addition to the New York State list if accepted by NYSARC. The Brooklyn Christmas Count last Saturday recorded 132 species including a drake BARROW'S GOLDENEYE an EARED GREBE and some RED-NECKED GREBES all in Jamaica Bay, AMERICAN BITTERN, GREEN HERON a RED PHALAROPE along the Brooklyn waterfront, LESSER BLACK-BACKED GULL, GLAUCOUS GULL, RAZORBILL, SNOWY OWL, LONG-EARED OWL, a NORTHERN SHRIKE at Floyd Bennett Field, ORANGE-CROWNED WARBLER, a BLACK-AND-WHITE WARBLER in Prospect Park, a YELLOW-BREASTED CHAT, CHIPPING SPARROW and BALTIMORE ORIOLE. Count period birds featured MARBLED GODWIT and AMERICAN REDSTART. Look for the BARROW'S in the bay north of the West Pond it also tends to overnight on the West Pond. The EARED GREBE was still present today just off the Broad Channel community and the NORTHERN SHRIKE was still along the most northerly runway at Floyd Bennett Field today. The Montauk Count Saturday tallied 123 species including the GREATER WHITE-FRONTED GOOSE at the Deep Hollow Ranch off Route 27, EURASIAN WIGEON on Gardiner's Island, 2 drake KING EIDERS one off Camp Hero and 1 at Gardiner's, 6 RED-NECKED GREBES, 4 BALD EAGLES and 5 ROUGH-LEGGED HAWKS on Gardiner's, 2 ICELAND GULLS and 2 LESSER BLACK-BACKED GULLS, 96 RAZORBILLS, a BLACK GUILLEMOT flying west off Montauk Village, SHORT-EARED OWL, ORANGE-CROWNED WARBLER, YELLOW-BREASTED CHAT, a CLAY-COLORED SPARROW at Accabonac and "NORTHERN" ORIOLE. The Northern Nassau Count Saturday featured 111 species including GREATER WHITE-FRONTED GOOSE, CACKLING GOOSE, a female KING EIDER off Glen Cove, 18 NORTHERN GANNETS, 5 RED-NECKED GREBES, LESSER BLACK-BACKED GULL, 5 RAZORBILLS, BALD EAGLE, 2 COMMON RAVENS, 3 HOUSE WRENS, ORANGE-CROWNED WARBLER and LINCOLN'S SPARROW. On Sunday the Sagaponack Count netted 117 species both 1 GREATER WHITE-FRONTED GOOSE and 2 CACKLING GEESE, a drake KING EIDER off Mecox, a LONG-BILLED DOWITCHER at Hook Pond, 4 RAZORBILLS, SHORT-EARED OWL and 3 LONG-EARED OWLS, a RUFOUS HUMMINGBIRD, 2 ORANGE-CROWNED WARBLERS and 2 YELLOW-BREASTED CHATS. The Captree Count Sunday totaled 116 species with 3 CACKLING GEESE, RED-NECKED GREBE, 2 AMERICAN BITTERNS, BLACK RAIL, LESSER BLACK-BACKED GULL, 4 RAZORBILLS, a SNOWY OWL on Fire Island, SHORT-EARED OWL, HOUSE WREN, VESPER SPARROW and SEASIDE SPARROW. The Greenwich-Stamford Count Sunday had 101 species including a female BARROW'S GOLDENEYE, NORTHERN GANNET, RAZORBILL, BLUE-GRAY GNATCATCHER and BALTIMORE ORIOLE. Highlights in Manhattan included the RUFOUS HUMMINGBIRD continuing at least to Thursday at the American Museum of Natural History usually in flowers to the left of the planetarium entrance off 81st Street, 2 YELLOW-BREASTED CHATS and LINCOLN'S SPARROW lingering in Bryant Park and a DICKCISSEL with House Sparrows at Inwood Hill Park. In Central Park an immature RED-HEADED WOODPECKER has been around the Hallett Sanctuary in the southeast section of the park and other notable recent species have included EASTERN PHOEBE, NASHVILLE WARBLER and BALTIMORE ORIOLE with 3 ORANGE-CROWNED WARBLERS in Manhattan last Sunday. The adult BLACK-HEADED GULL was still present today in Brooklyn where it sometimes frequents the Owl's Head waste water treatment plant and can be viewed from the hillside at Owl's Head Park or from Veteran's Memorial Pier. The GLAUCOUS GULL was near the Breezy Point jetty Tuesday. At Jones Beach West End Thursday 2 COMMON RAVENS were being harassed by some crows, a pair of HARLEQUIN DUCKS and 2 RAZORBILLS were still around Jones Inlet and 9 SNOW GEESE joined some COMMON EIDERS on a bar inside the inlet. Out at Montauk Point a DOVEKIE was spotted Wednesday off Camp Hero and then off the lighthouse. Last Monday in East Hampton 2 GREATER WHITE-FRONTED GEESE were on Hook Pond along with the one continuing down Further Lane. A female HARLEQUIN DUCK has been along the western jetty at Shinnecock Inlet since Saturday and a GREATER WHITE-FRONTED GOOSE has been at the Northport High School recently. 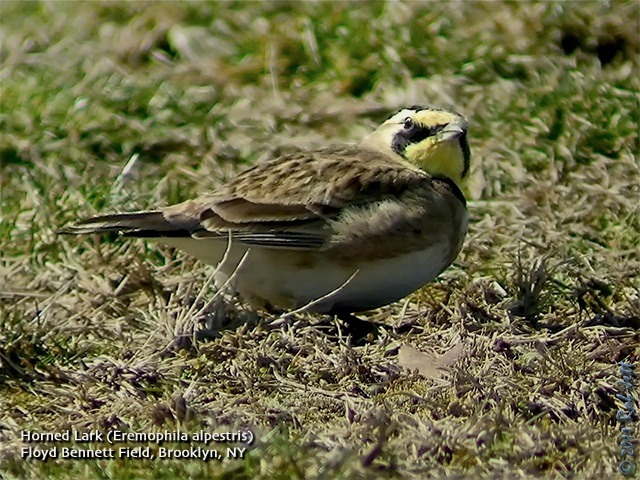 The Horned Lark is an arctic breeding species that regularly overwinters around coastal New York City. Historically, they also bred along the coast at Breezy Point. 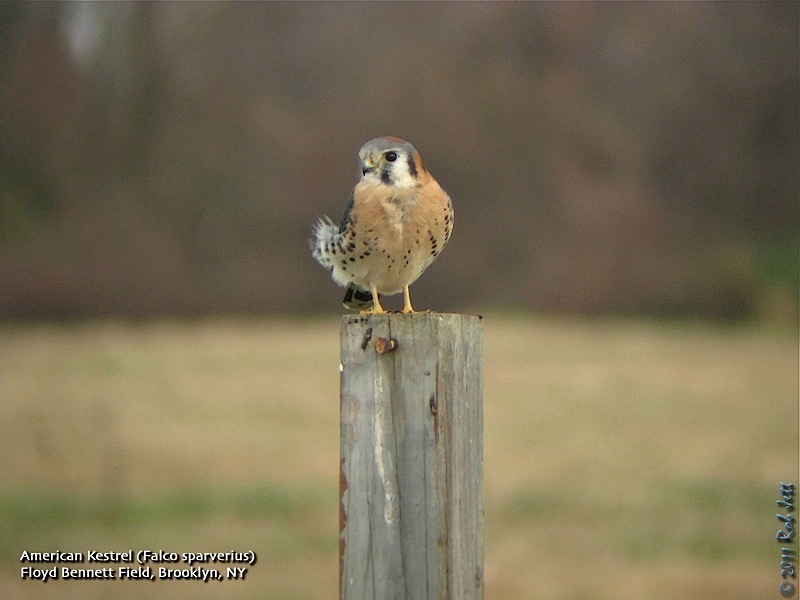 During the winter they are usually found feeding in fields of stubbly grass or dune habitats, Floyd Bennett Field is one of the best spots to find this gregarious bird. Greetings. This is the New York Rare Bird Alert for Friday, December 16th 2011 at 11am. The highlights of today's tape are RUFOUS HUMMINGBIRD, BROWN PELICAN, AMERICAN AVOCET, LITTLE GULL, GREATER WHITE-FRONTED GOOSE, HARLEQUIN DUCK, KING EIDER, RAZORBILL and more. A selasphorous hummingbird found Wednesday at the American Museum of Natural History was still present this morning around the plantings on the east or left side of the entrance to the planetarium off 81st Street. The bird shows plumage characters interesting enough to evoke discussions on whether this is a Rufous or a different selasphorous not Allen's but Broad-tailed being the other contending species. However, close scrutiny would seem to indicate this is an immature RUFOUS HUMMINGBIRD. A female RUFOUS HUMMINGBIRD was still visiting the feeders at the Lenoir Preserve's butterfly garden in Yonkers as of Wednesday. To reach Lenoir, from the Sawmill River Parkway, Exit 9, take Executive Boulevard to its end at North Broadway, go right on North Broadway a short distance to Dudley Street on the left, the preserve parking lot is on the left. Last Tuesday afternoon a boater in western Long Island Sound photographed an immature BROWN PELICAN sitting on Execution Light this a small island in the sound between New Rochelle in Westchester County and Sands Point on Long Island. Please keep us informed of further sightings. Another exciting Westchester bird was a RAZORBILL off Reade Sanctuary / Playland Park in Rye Monday and Tuesday. To our knowledge the Brooklyn AMERICAN AVOCET has not been seen in Coney Island Creek since last Saturday morning. Last Saturday an adult LITTLE GULL appeared in the large congregation of Bonaparte's and other gulls feeding outside of Jones Inlet as viewed from the Point Lookout side. It could not be relocated on Sunday under different weather conditions though many gulls did continue there. Also off Point Lookout 10 RAZORBILLS gathered in a flock offshore Saturday afternoon, a drake HARLEQUIN DUCK on the ocean Sunday was joined by a female around the jetties as of Wednesday. Several COMMON EIDER continue in that area and a FORSTER'S TERN was still present Sunday. Shorebirds on the Coast Guard bar last weekend at Jones Beach West End featured a presumed WESTERN SANDPIPER a rather short billed individual. A very diminished number of RED KNOT and 2 LONG-BILLED DOWITCHERS the latter also noted on Wednesday when 12 RAZORBILLS were spotted in the inlet. Other city reports include the continuing presence of YELLOW-BREASTED CHAT and LINCOLN'S SPARROW in Bryant Park Manhattan, an ORANGE-CROWNED WARBLER at Swindler's Cove on northern Manhattan last Saturday and in Kissena Park in Queens a nice assortment of Christmas Count hopefuls including up to 3 ORANGE-CROWNED WARBLERS, a NASHVILLE WARBLER, HOUSE WREN, BALTIMORE ORIOLE and some RUSTY BLACKBIRDS and other good count birds are lingering in various parks. The GREATER WHITE-FRONTED GOOSE has returned to Saint John's Pond seen Wednesday and Thursday on the pond off the south side of Route 25A a little southwest of Cold Spring Harbor. A female KING EIDER found Saturday off East Island in Glen Cove just west of Bayville was still there on Thursday. Two ORANGE-CROWNED WARBLERS were at the Cedar Beach overlook parking lot last Saturday. A few reports from out east this weekend mentioned the GREATER WHITE-FRONTED GOOSE continuing at the Deep Hollow Ranch on the south side of Route 27 east of the town of Montauk and 2 ICELAND GULLS around the Montauk Harbor Inlet these on Saturday. Four RAZORBILLS were off Mecox Tuesday. We'd be happy to report the highlights of our regional Christmas Counts so please call them in. On Long Island, call Tony Lauro at (631) 734-4126, or weekdays call Tom Burke at (212) 372-1483. In recent weeks I've been searching coastal Brooklyn for overwintering waterfowl and gulls. While I haven't found any unusual species I have noticed a huge increase in Red-breasted Mergansers. Flocks of over 100 individuals (sometimes a lot more) can be found everywhere from the bay off Coney Island to the ocean. This bird was photographed in Gravesend Bay. This may not seem like a typical season for breeding birds, but there is a least one species that has begun the process. During much of the year I rarely find the Green-Wood Cemetery Great Horned Owls roosting close to each other. Come December, however, they appear to be inseparable. 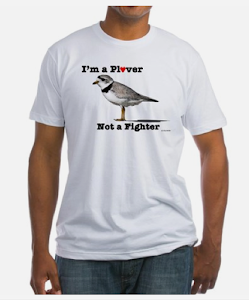 If I can find one, its mate is usually perched a few feet away. As of a couple of weeks ago, our two Brooklyn owls are now in breeding mode and should be on nest within about a month. There is a good reason that they start in the dead of winter - incubation takes about a month; the owlets don't fledge for another month; they rely on learning hunting skills from their parents for another 3 to 5 months. 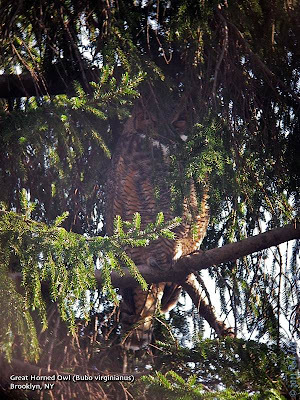 If all goes well, the first brood of Brooklyn Great Horned Owls in probably 100 years will be self sufficient by next Fall. Separating our female owl from her mate is sometimes a bit tricky. 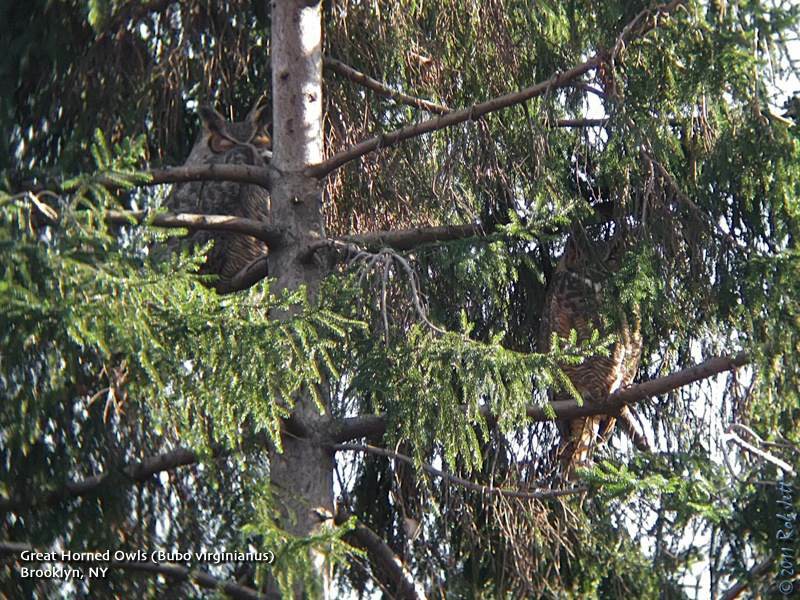 Seen together, there is an obvious difference as the female is significantly larger and bulkier. She also tends to be more vigilant and less tolerant of people. I'll always try my best to be silent when near them, but if I encroach on her comfort zone, she'll open her eyes and shoot me a look like she's preparing to fly down and rip my face off if I don't back off. 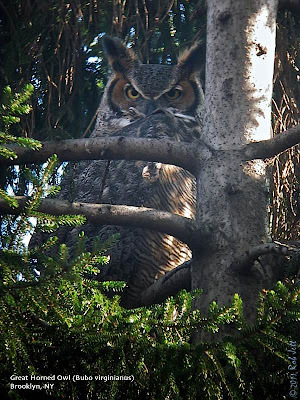 Fortunately, Great Horned Owls aren't known for that type of aggressive behavior, but I totally get where she's coming from. In addition to her immense size and scary gaze, I've also noticed that she is very gray in color. She does have the characteristic rusty-orange facial disks and wash on her underside, but her forehead and back are a perfect match for gray tree bark. 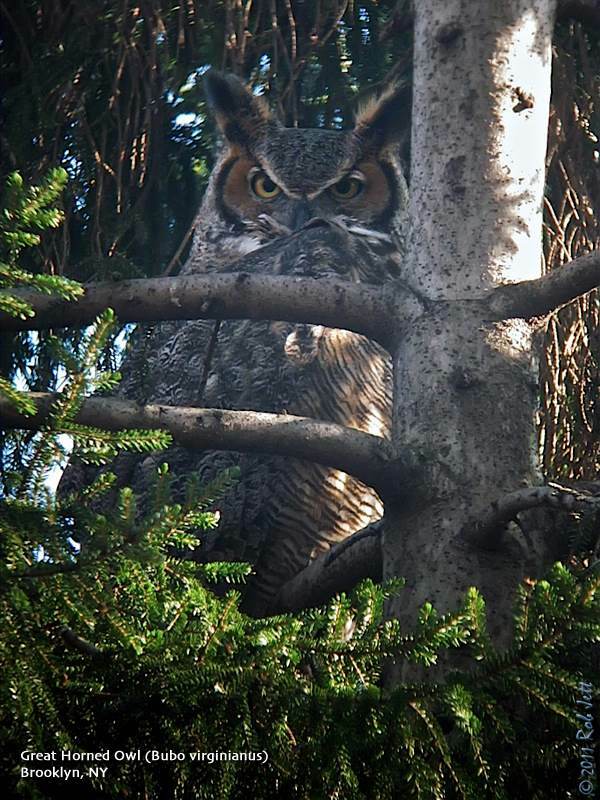 Compared to our female owl, the male Great Horned Owl is tall and slim, almost like a Long-eared Owl. Unlike the terrifying persona of his mate, he tends to be more easygoing. More often than not, he won't even open his eyes when Marge or I are nearby. Occasionally, he'll lazily peek out of one eye, then go back to snoozing. He is also much more rufous in coloration. As you can see here, his underside is very orange-red. There is also a lot of rusty color on his forehead, whereas the female has almost none at all. 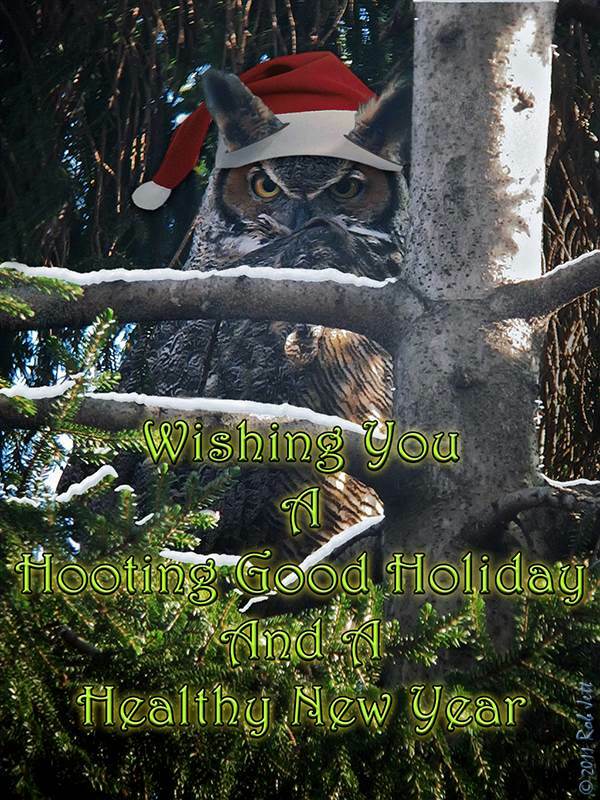 This week is the start of the Christmas Bird Count period, so rather than list the weekly upcoming trips I've provided information on where and when to participate. The Christmas Bird Count, begun by Frank Chapman in 1900, has grown to become the largest wildlife survey on the planet. He began with a group of just 27 people covering only a few areas, but by last year it had expanded to 2215 counts and tens of thousands of participants - a new record. You can download a summary of the 2010 counts here. Below is a chart showing the counts being held within New York City. For a complete list of counts being held statewide check the New York State Ornithological Society's CBC webpage here. To search for count information in your state click here. So … I'm in Cedar Dell where the old brownstone monuments are and the "Sea Captain" overlooks it. I take my tour inside there to see the skull and crossbones on the old brownstone. As I'm boarding the trolley I look, and in the distance, I see a huge form in the tree. I said to the passengers, "It must be one of our red-tails, let me get my bins". One person said, "Wow, that bird looks big" and I said, "It sure does". It was in a tree up on the path by the "Sea Captain", I was all the way across Cedar Dell. 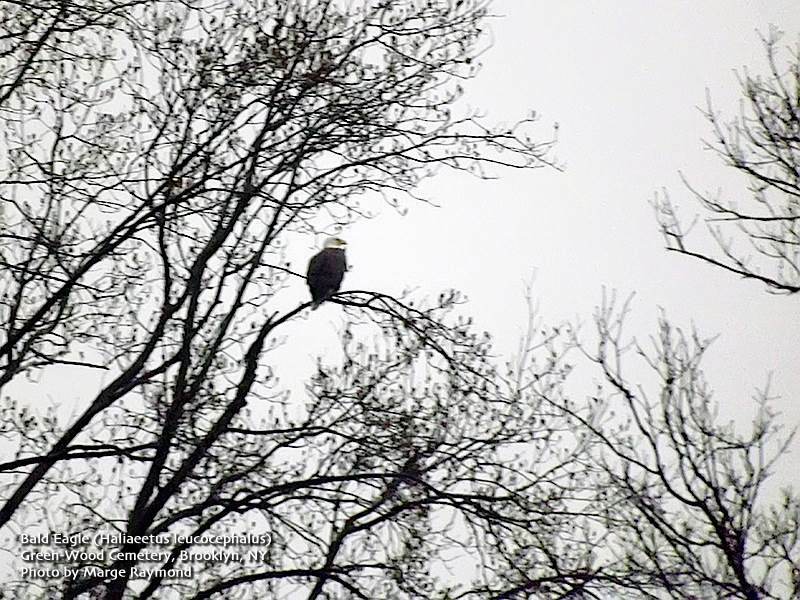 I took out my bins and immediately exclaimed, "Oh my God, it's a Bald Eagle. I have to get a pic or no one will believe me!" I ran across Cedar Dell, got a lot of blurred pics and then my camera DIED. The batteries went dead. All I got were 3 pics […]. As I got closer, he flew off. He was tremendous. It made my day. Greetings. This is the New York Rare Bird Alert for Friday, December 9th, at 6:00pm. The highlights of today's tape are SNOWY OWLS, AMERICAN AVOCET, EARED GREBE, NORTHERN SHRIKE, ROSS'S GOOSE, GREATER WHITE-FRONTED GOOSE, BARROW'S GOLDENEYE, HARLEQUIN DUCK, GLAUCOUS GULL, ICELAND GULL, and more. 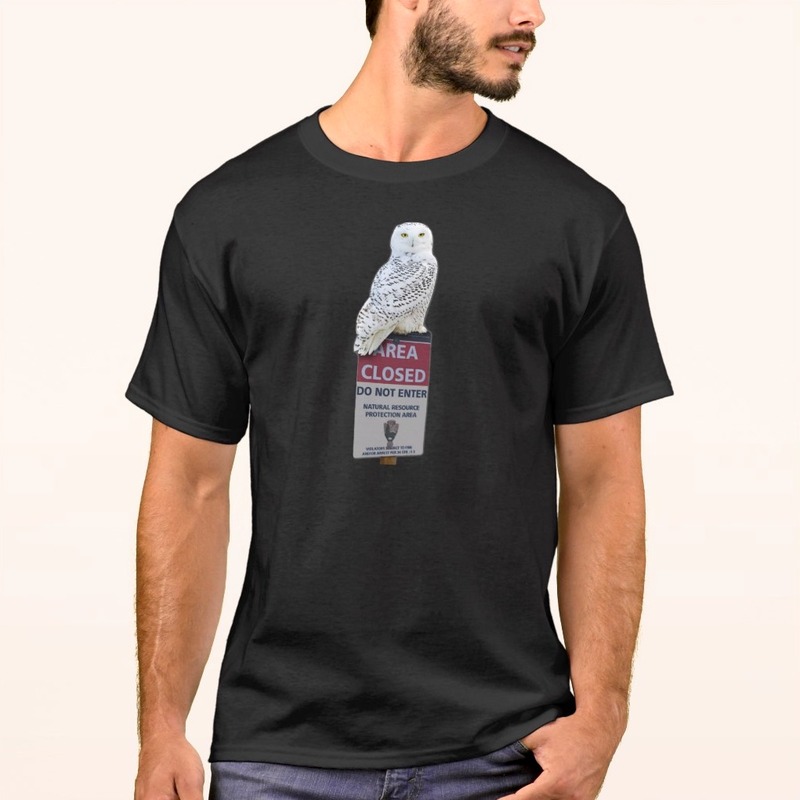 A SNOWY OWL put in an appearance at Jones Beach West End last Sunday, sitting in the dunes between the swale (off the West End 2 pavilion) and the West End jetty, closer to the swale. 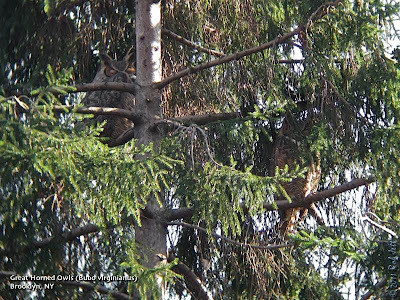 The owl was pushed about during the day, flying frequently, and was not seen after Sunday. If you'd like such an owl to stay longer for others to enjoy and feel unthreatened in the process, please keep a respectful distance away. 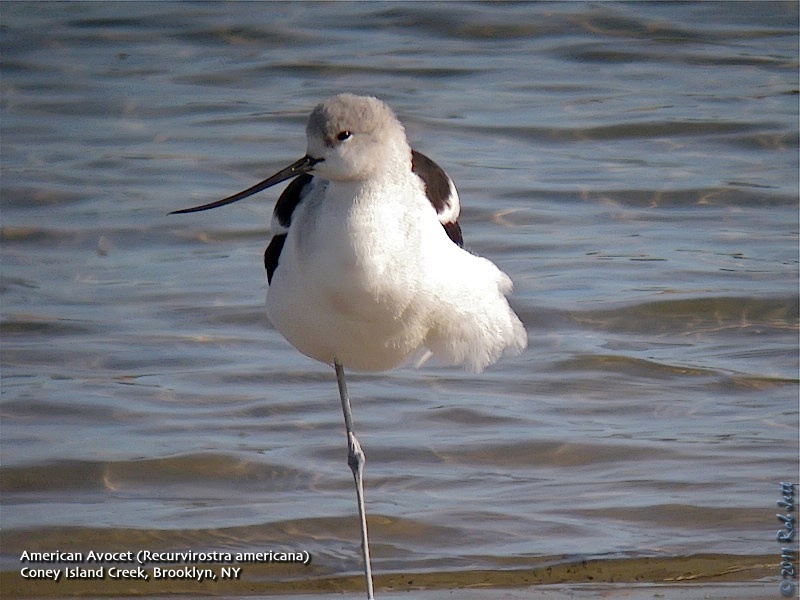 An AMERICAN AVOCET was found in Brooklyn last Saturday and was still around Coney Island Creek this afternoon. The bird is generally seen in the vicinity of Calvert Vaux Park or Leon Kaiser Park on the south side of the creek. A viewing vantage point has been from the shore beyond the ball fields next to the Home Depot. 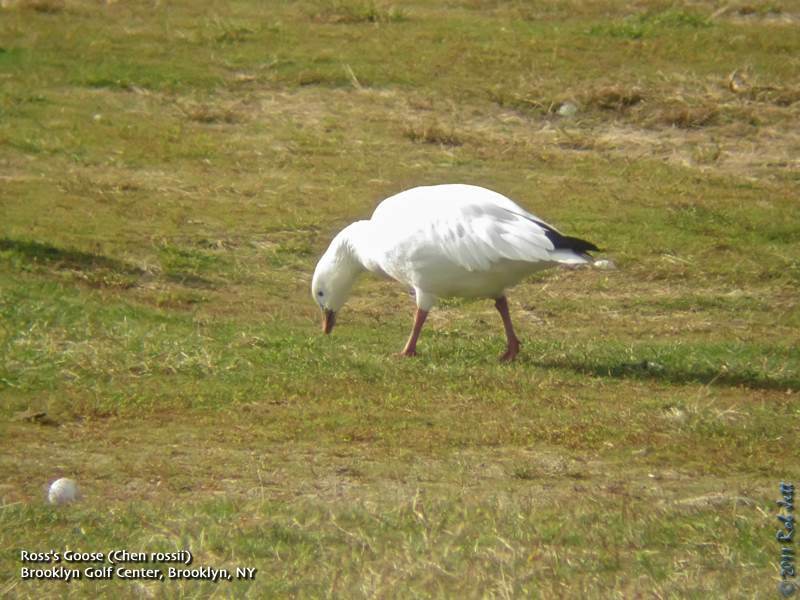 A ROSS'S GOOSE was reported in the same area Saturday, but a lone Snow Goose was apparently also in that area Sunday. There is some question as to whether two AVOCETS were present last Saturday, as one at Jamaica Bay Wildlife Refuge was seen flying into the East Pond, as well as at the West Pond in the early afternoon, and was again at the West Pond late in the day. Also at Jamaica Bay, the EARED GREBE was spotted again in the bay, south of the West Pond on Sunday. And last Saturday afternoon, a drake BARROW'S GOLDENEYE visited the West Pond with a few COMMON GOLDENEYE, joining a large raft of ducks on the pond. Presumably this particular Barrow's has wintered in Jamaica Bay in previous years and will hopefully stick around. Back on the Jones Beach strip, a NORTHERN SHRIKE was found Tuesday just west of the entrance to Cedar Beach Marina on the north side of Ocean Parkway. Last Saturday two RAZORBILLS were inside Jones Inlet, with at least one there Sunday. Shorebirds Sunday at West End featured a SEMIPALMATED PLOVER, a WESTERN SANDPIPER, and about 40 RED KNOT, while a PIPING PLOVER spotted Sunday on the beach at Point Lookout was probably the same bird present Thursday in the West End 2 swale. A drake HARLEQUIN DUCK was seen around the Point Lookout jetties Sunday and Thursday. An immature GLAUCOUS GULL was still on the beach just west of the Fort Tilden fishermen's parking area last Sunday. At Bryant Park, Manhattan, it was believed that two YELLOW-BREASTED CHATS were present early in the week, and a LINCOLN'S SPARROW was still hanging on there on Wednesday, while on Thursday an ORANGE-CROWNED WARBLER was seen again at Canarsie Beach Park in Brooklyn. Out on eastern Long Island, a SNOWY OWL appeared last Saturday in the ocean dunes near the Ponquogue Bridge west of Shinnecock Inlet, and a SNOWY OWL sometimes observable on Hicks Island from the end of Lazy Point Road in Napeague was seen there both last Saturday and Sunday. Also at Shinnecock last Sunday, two RAZORBILLS and a large flock of COMMON EIDER were well inside the inlet, a BALD EAGLE flew in off the ocean, and along Dune Road were GREAT EGRET, AMERICAN BITTERN, and two SEASIDE SPARROWS. At Hook Pond in East Hampton Sunday were two GREATER WHITE-FRONTED GEESE and a CACKLING GOOSE, the White-fronts presumably the birds often feeding along Further Lane. Land birds in the Mecox-to-Bridgehampton thickets on Sunday included three YELLOW-BREASTED CHATS and an ORANGE-CROWNED WARBLER. In the Montauk area, Sunday counts of birds along the north shore from Springs to the Montauk Harbor Inlet included 125 RAZORBILLS, 725 RED-THROATED LOONS, 489 COMMON LOONS, and 5 RED-NECKED GREBES, the grebes being most regular in Fort Pond Bay or off Culloden Point. Also last Sunday an adult ICELAND GULL was around the Montauk Harbor Inlet, and another 60 RAZORBILLS plus a BALTIMORE ORIOLE were at Montauk Point. The number and diversity of land birds in NYC's inland parks have dramatically dropped off over the last few weeks. The inactivity in Prospect Park the other day was depressing. The only wildlife at the annual Breeze Hill bird feeders were two portly Gray Squirrels gorging on sunflower seeds. Perhaps the winter birds from the latter half of the Fall migration have continued to more southerly locations and the species that normally overwinter in our park woodlands have yet to arrive. During the week a story appeared in one of the local news blogs about a Snowy Owl sighting on Hoffman Island, near the Verazzano Bridge. 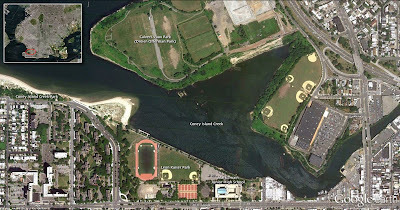 Heydi and I headed down to Coney Island over the weekend optimistic that the owl would fly across the water to the dunes along Coney Island Creek. From the fishing pier there appeared to be a tremendous amount of gull activity near the Rockaway Inlet, but it was too far to identify anything unusual. There were several hundred Red-breasted Mergansers a little closer to us, in fact, mergansers have suddenly appeared in large numbers all around the coast. 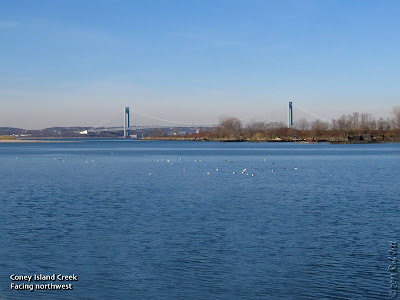 The temperature was relatively warm for early December and the water was like glass, so I couldn't blame the weather for my inability to locate any new birds in the water off of Coney Island. 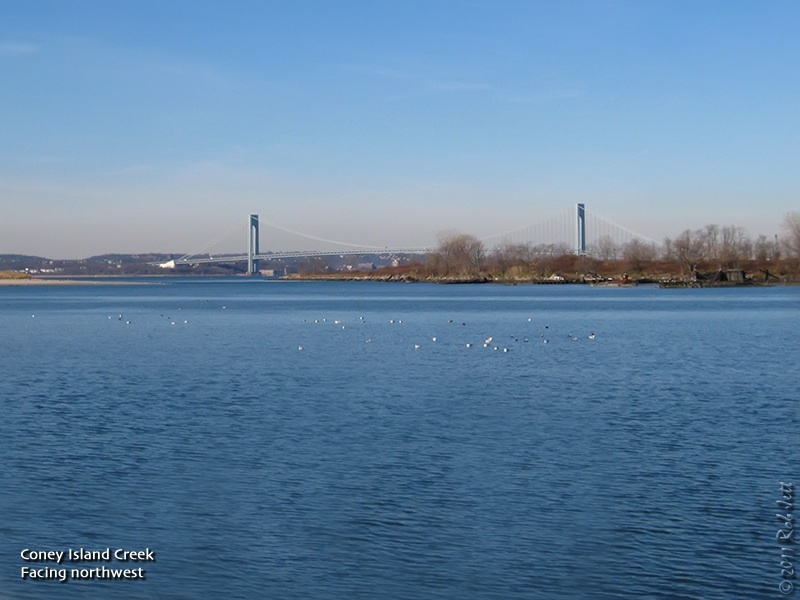 Scanning Gravesend Bay towards the Verazzano Bridge only turned up a few loons, some Buffleheads and Red-breasted Merganser and the expected gulls. After a moment I thought that, perhaps, it might just be a gull with some wing feathers out of place. Also, from that distance, I couldn't tell if it was standing in the water or on the shore, so judging the length of its legs was impossible. It was compelling enough that we decided to get a closer look. We walked to a small concrete pier about a hundred yards closer. The idea of it being an avocet was still in my head, but I tried to talk myself out of it and from the new location we thought that it might not be a gull, but possibly a Long-tailed Duck sitting on the shore. We had to get closer and walked to the edge of the creek behind Mark Twain Junior High School. 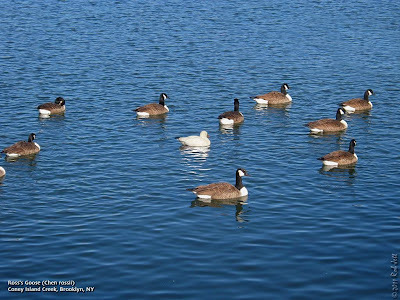 As we approached the handball courts next to the creek I noticed a small, white goose within a flock of Canada Geese. I thought it might be a Ross's Goose and focused my scope on it. It was a Ross's Goose and we decided to try and take some photos of it in the bright, early morning sunshine. The flock was paddling away from us, so we crossed the school's parking lot and walked down Neptune Avenue to West 23rd Street. West 23rd Street dead-ends at the water and there are frequently lots of waterfowl in that spot. Of course by the time we walked the 1/4 mile to get closer to the goose, they had all turned around and gone back...so we did, too. After a minute of "Holy craps" and high-fives we began texting people to get the word out. This was a significant find and many people would be dropping everything to come and see this unusual shorebird. In addition to it being a rare vagrant to NYC, Bull's Birds of New York State lists November 15th as the extreme date. These birds usually migrate along the west coast, but they are being seen with more frequency in the east. We never did see any eiders or rare gulls, but my first Brooklyn American Avocet more than made up of it. Check out some of Heydi's photos here. 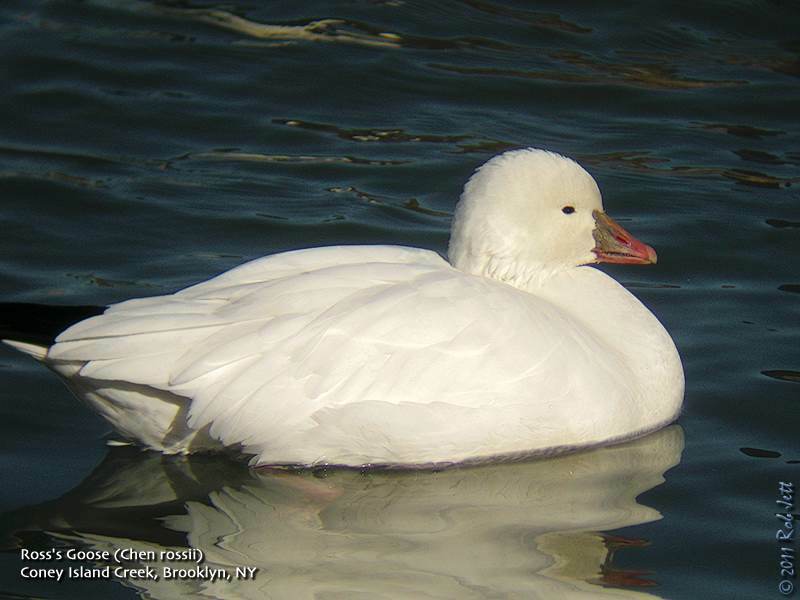 I spotted this Ross's Goose in Coney Island Creek a week after my "life" ross's sighting at the Brooklyn Golf Center. Rare in Brooklyn during any season, I think it is very likely the same individual moving around the borough. Learn to identify the Ross's Goose here. November wasn't a big month for new birds, although I did manage to add a handful of year species. One nice surprise was the addition of a life bird. During November of 2010 I added a total of four new year birds, one of which was a life bird. Coincidentally, this past November I also added four new birds, one of which was also a life bird. The month had a very promising start when I found three new species in one day. Spring Creek is a muddy little inlet located between two capped landfills, runs under the parkway at Erskine Avenue and ends (or begins) at a water treatment plant. The water rarely freezes here and is an interesting place to look for waterfowl, wading birds and raptors in the winter. On the first weekend of the month there were several Long-billed Dowitchers and a flock of yellow-legs feeding along the creek's exposed, low-tide mudflat. From there we headed over to Jamaica Bay Wildlife Refuge to look for a reported Eared Grebe. We found the grebe and, while still at the refuge, also spotted a pair of Blue-winged Teal resting on the shore of the West Pond. Ironically, I had given up on the possibility of finding one of these beautiful ducks this year. It would be three weeks before I located another new bird species for the year. During Thanksgiving week, when I was 200 miles from Brooklyn, I got to read all about the happy birders going to see a Ross's Goose near Flatbush Avenue. I'd somehow managed to miss seeing this diminutive, white goose in the nearly 20 years that I've been looking at birds. I assumed that this one would also elude me. Fortunately, I was wrong as the bird seemed to enjoy the accommodations in Brooklyn and I got to see it when I returned after the holiday. Just a quick note about my "October Birds" posting. I hadn't entered my October 30th sightings when I created the posting, so one NYS species was inadvertently omitted from the total. Heydi and I had seen several White-winged Scoters while scoping from the beach at Fort Tilden. My state final total should have been 253. Kinzie Street: Chicago's First Protected Bike lane from Streetfilms on Vimeo. Sunday, December 11, 2011, 10 a.m.
Notes: Use www.hopstop.com for guidance. There will be extensive walking towards Sherman Square/Grand Army Plaza (NYC) at 59th street and 5th Ave where leader will exit. Birders can leave en route for a shorter walk. From reptiles and amphibians to birds and mammals, we’ll look for signs of animal life during this one and a half mile hike through the woodlands of Long Pond Park. In addition evidence of the geologic history and human influence on the park will also be observed. Meet at PS 6, on Page Avenue and Academy Avenue about 3 blocks NW of Hylan Blvd. Saturday, December 10, 2011, 10:00 a.m. to 2:00 p.m.
For the 186th consecutive monthly restoration we will meet in the parking lot of the Greenbelt Nature Center at the junction of Rockland Avenue and Brielle Road. We will walk sections of the White and Blue Trails where we will spend two hours removing vines from saplings along the trails. If you don’t have your own, Protectors will supply gloves and pruners (& refreshments). After a two hour work session, we will take a short walk over nearby trails. Greetings. 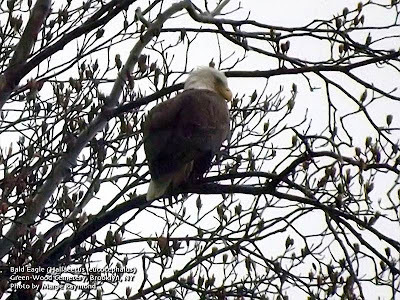 This is the New York Rare Bird Alert for Friday, December 2nd 2011 at 7pm. The highlights of today's tape are WHITE-WINGED DOVE, RUFOUS HUMMINGBIRD, ASH-THROATED FLYCATCHER, BROWN PELICAN, EARED GREBE, SNOWY OWL, LITTLE GULL, BLACK-HEADED GULL, ROSS'S GOOSE, BARROW'S GOLDENEYE and much more. A WHITE-WINGED DOVE was seen and photographed Sunday and Monday in a backyard in the Sheepshead Bay section of Brooklyn but has not been reported since. This perhaps the same bird present in Stamford Connecticut to last Friday. An immature female RUFOUS HUMMINGBIRD continues at the Lenoir Preserve in Yonkers joined as of Friday by an immature male RUBY-THROATED HUMMINGBIRD. To reach the preserve, from Sawmill River Parkway, Exit 9, take Executive Boulevard to North Broadway, go right on North Broadway a short distance to a left onto Dudley Street. The Lenoir parking lot is on the left and walk to the butterfly garden. Two other hummingbirds at private feeders on eastern Long Island also appear to be RUFOUS. At Jones Beach West End the ASH-THROATED FLYCATCHER was last noted along the fisherman's access road west of the Coast Guard Station last Saturday. A BROWN PELICAN was reported flying into the inlet and past the Meadowbrook Parkway Bridge on Monday. The Jamaica Bay Wildlife Refuge EARED GREBE has not been spotted recently in the bay south of the West Pond where it had been staying but was reported on the West Pond on Monday. Two AMERICAN BITTERNS were south of the West Pond Sunday. As part of the late fall influx of SNOWY OWLS into the northeast one was photographed by a fisherman early in the week on Hoffman Island - a small island off the east shore of Staten Island a couple of miles south of the Verrazzano Bridge. The Brooklyn ROSS'S GOOSE has recently been spending much of its time at the Brooklyn Golf Center on the west side of Rockaway Boulevard but was seen again Wednesday and Thursday back across the boulevard near the Aviator's Sports Building at Floyd Bennett Field. An immature LITTLE GULL reported off Breezy Point Saturday was perhaps the same individual seen Sunday off Riis Park while a real life air/sea rescue was going on offshore. Also on the ocean in the Riis to the Rockaways area Sunday were hundreds of BONAPARTE'S GULLS feeding with LAUGHING GULLS and other gulls offshore the activity pulling in several PARASITIC JAEGERS from midday through the afternoon. In addition 2 to 3 RAZORBILLS and RED-NECKED GREBE were seen as well as good numbers of NORTHERN GANNETS, scoters (WHITE-WINGED SCOTER, SURF SCOTER & BLACK SCOTER) and loons (COMMON LOON & RED-THROATED LOON). 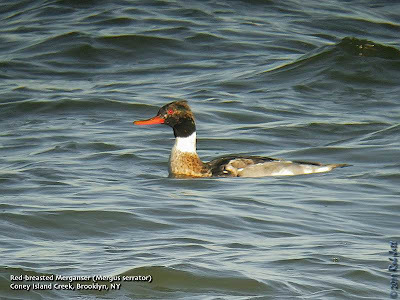 On Saturday an adult BLACK-HEADED GULL was reported from the Riis Park / Rockaways stretch of beach and an immature male HARLEQUIN DUCK was spotted at the jetties by the Fort Tilden's fisherman's lot. An immature GLAUCOUS GULL was present near this lot Tuesday through Thursday. The Van Cortlandt Park GREATER WHITE-FRONTED GOOSE was seen last Friday. The YELLOW-BREASTED CHAT and a LINCOLN'S SPARROW were still in Bryant Park Manhattan on Thursday. A lot of excitement was caused by a TROUPIAL seen Monday to Wednesday in Roslyn Long Island. This non-migratory Black-backed or Venezuelan Troupial also introduced into Puerto Rico is a common cage bird and is endangered in its native territory due to extensive trapping. On Tuesday the seawatch off Robert Moses State Park produced 1 PARASITIC JAEGER, 1 ROYAL TERN and 66 RAZORBILLS. Out east growing numbers of RAZORBILLS off Montauk Point peaked at about 400 mostly moving by on Wednesday and other birds at the point featured a male HARLEQUIN DUCK last Friday and occasional BLACK-LEGGED KITTIWAKES. An immature BROWN PELICAN was present Saturday and Sunday along the east side of Fort Pond Bay and scattered RED-NECKED GREBES have been most reliable in Fort Pond Bay. The GREATER WHITE-FRONTED GOOSE was still at the Deep Hollow Ranch in Montauk to Wednesday and single CACKLING GEESE were at Agawam Pond and in Noyack Sunday. Gulls featured an ICELAND GULL at Montauk Harbor Inlet Sunday and a few LESSER BLACK-BACKED GULLS including a winter resident at Napeague. The landbirds out east featured a DICKCISSEL in Ditch Plains and an ORANGE-CROWNED WARBLER and 2 YELLOW-BREASTED CHATS at Mecox all on Sunday. Drake EURASIAN WIGEON were at West Lake in Patchogue recently and in Setauket Harbor Tuesday and as of last Friday the North Fork drake BARROW'S GOLDENEYE was back along the south side of the Route 25 causeway between East Marion and Orient. 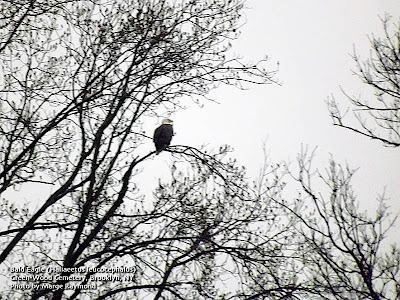 Check out another New York City nature lover at the Urban Wildlife Guide blog. 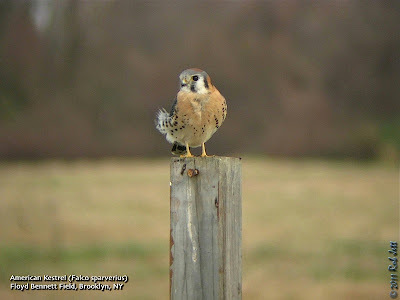 Feeding on insects, rodents and, occasionally, small birds, the American Kestrel is North America's smallest falcon. This individual at Floyd Bennett Field was diving into the grass and returning to the sign post with crickets to eat. I've been birding for nearly 20 years and have seen some pretty amazing birds around New York. 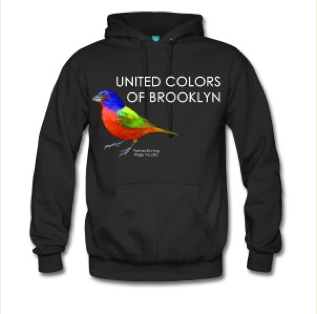 My Brooklyn list is getting close to 300 species. Each new species that I see in New York State makes the odds of getting to see a life bird in Kings County a little less probable. On Monday, however, I was able to add a new species, not just for Brooklyn, but for my overall life list. 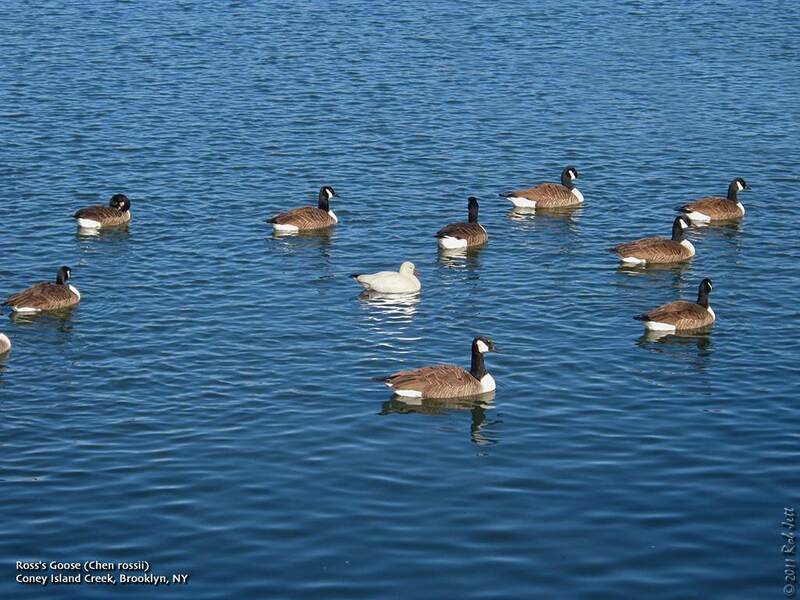 On Monday, November 21, I received a text message from Doug that he was looking at a Ross's Goose within a flock of Canada Geese at Floyd Bennett Field. It would have been impossible for me to run down there, so was resigned to the fact that I'd miss seeing one of these tiny geese ... again. They are seen sporatically around NYC, just not by me. In addition, during a birding road trip with friends in 2006 to upstate New York, several were seen flying within immense flocks of Snow Geese, again, not by me. Unfortunately, I would be leaving the next day to visit family for Thanksgiving and wouldn't be back until late Saturday night postponing my life Ross's Goose sighting until who-knows-when. I decided not to make myself crazy over missing this species, because with south winds predicted for the week there was a fairly good possibility that it would hang around Brooklyn. I was feeling even more optimistic when Heydi texted me on Saturday that she spotted it feeding on the grass at the driving range across Flatbush Avenue from Floyd Bennett Field. On Sunday morning I took the subway then the bus to Floyd Bennett Field. The bus stops directly in front of the Brooklyn Golf Center. I had in the back of my mind that I'd get off the bus, walk up to the driving range and see the Ross's Goose immediately. Then I would turn around and go back home in time for lunch with Robin. Things aren't always as simple in reality. There weren't any geese on the driving range and, due to the beautiful, warm sunny weather, there were plenty of people whacking golf balls. I walked across Flatbush Avenue and spent the next few hours wandering the grassland and surrounding habitats looking for flocks of geese. 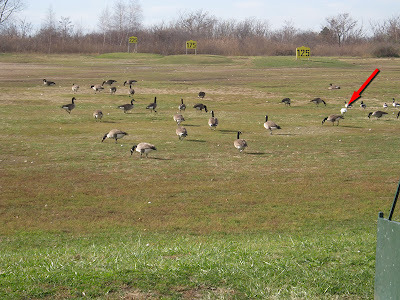 When I couldn't find any, I walked back to the driving range, hoping that the geese had returned to feed on the stubbly grass. They hadn't, so I waited for the bus and headed home. Later that night I read on the NYS Birding list that the Ross's Goose had been seen at the driving range at dusk. DOH! On Monday I decided to try my luck again and run down to Floyd Bennett Field over lunch time. 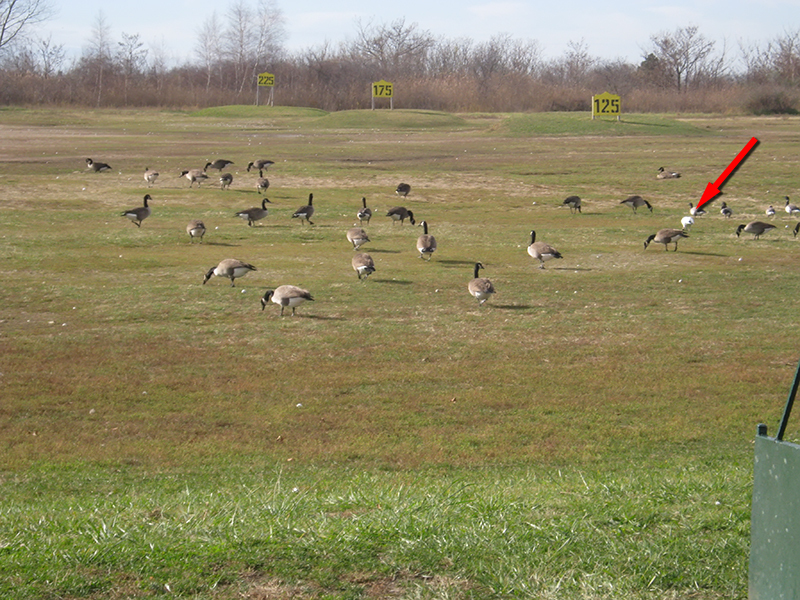 This time there was nobody driving balls at the golf center and a few Brant and Canada Goose were feeding on the grass. There was no sign of a tiny, white goose. I thought about just waiting around to see if it returned, but figured that it could also be feeding on the grasslands across the road at Floyd Bennett. I walked across Flatbush to Floyd Bennett Field. There were a few small flocks of Canada Geese on the recently mowed fields, but nothing unusual. Horned Larks have returned and a small flock was feeding on the cricket field's stubble. American Pipit, another arctic breeder, flew overhead making their namesake "pip-it, pip-it" flight call. 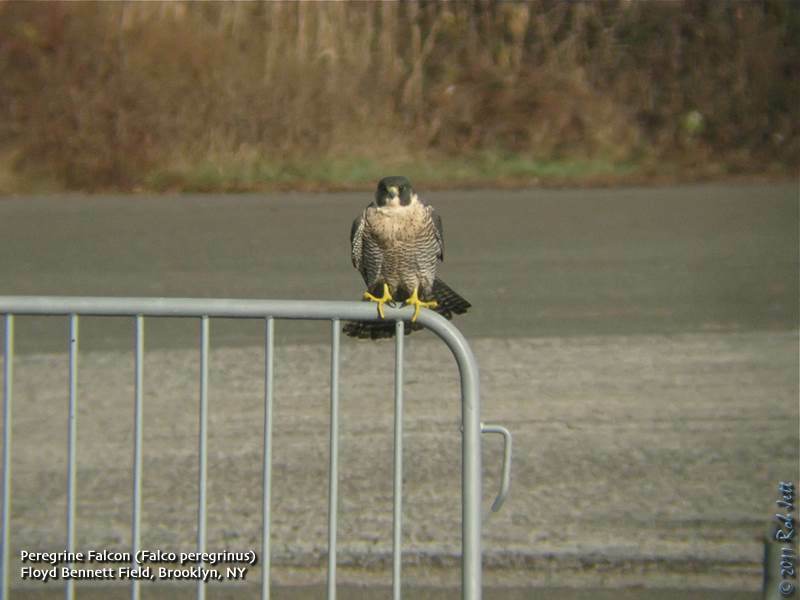 Near the runway next to the North 40 a Peregrine Falcon was drying off from a perch on a section of metal fencing after bathing in a puddle. Three American Kestrels seemed to be in an endless squabble with a Merlin that was patrolling the fields. After about 30 minutes, I returned to the driving range. Peering through the chain-link fence at the south end of the field, I noticed that the size of the feeding flock had increased considerably since I checked earlier. Near the center of the flock of Brant and Canada Geese was a compact, white goose. I finally found my life Ross's Goose. I walked across the parking lot to the opposite side of the field to get a closer look. There was a golfer directly in front of the flock getting ready to hit some balls. I was concerned that I'd finally found a Ross's Goose and now it was about to get nailed by a flying golf ball. Luckily, the guy seemed more concerned with perfecting his swing than bringing home a goose. I was really surprised that the birds didn't even flinch when the balls were whacked, even when they whizzed passed only a few yards over their heads. The Ross's Goose was smaller than I'd imagined. It nearly disappeared when a Canada Goose passed in front of it. It appeared to be about the same size as a Brant, although the Sibley guide data shows that they are a bit smaller. They also lack the "grin patch" that is seen on the Snow Goose. The website "Surfbirds" has a very good article on how to separate the Ross's Goose and Snow Goose here. I spent as much time as possible studying this Brooklyn rarity before grabbing the northbound bus. Finding a new bird is always a great experience, being able to share it with others is even better, so get over to Floyd Bennett Field this weekend and maybe you'll get lucky.